It's finally over - an entire week of Halloween parties and festivities that have been by turns fun and funny and opressive and delightful. We gave Dear Alex plenty of choices when it came to Halloween costumes - she passed on the bunny, the ladybug, and the princess, and firmly let us know what she wanted to dress up as - a fireman. I'm not sure where it came from, but it was definitive. 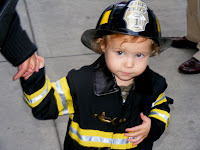 It may have come from the dress-up play at one of her classes, or maybe it was a visit to a fire company many months ago - I have to say that it was a good choice, a durable, wearable costume that looked pretty tough on a cute two-year-old. I liked her choice, and she did too - She wore the hat and coat around the house for days, and to at least four parties. It's been dress-up time around here lately as Dear Alex has been trying out all sorts of combinations of clothes and costumes from her collection. She has an apron, and monster truck boots, and a poodle costume from last year, and a tu-tu that someone gave us when she was born - the combinations have been unintentionally hilarious and creative. The fireman costume was something, though - It's very much as though she took it seriously. We made the occasion to take her for another visit to a firehouse, where she was warmly welcomed by a real fireman. (who was also impressed by her choice) Dear Alex got to see a real big red fire truck up close, see the lights and the steering wheel, and got to see what happens when a real emergency call comes in - the fun stopped, we stepped out, and they left in a hurry. I hope no one was hurt. I just watched a beautiful golden half-moon set over water, and wished that Dear Alex was awake to enjoy the view, to say a quiet 'goodnight moon' to the light in the sky that has held her attention since she was just a baby. (I know I've written about this before) It has something to do with my own fascination, being of an age that lets me remember being a child that got to stay up all night to witness man's first steps... Looking up tonight I thought about that, and what she'll see in her lifetime. It's positively humbling to be a parent, and to have hopes for an unknowable future. It's enough for me now to marvel at Dear Alex's memory, and the fact that we read 'goodnight moon' to her often enough that she can still recite the back cover from memory: "This classic bedtime story has lulled generations of children to sleep..."
So from now until she knows better, every book ends that way. Dear Alex seems to grow a little bit every day, and so far (knocking firmly on real wood right now) there's been no sign of the dreaded "terrible twos". Honestly, she definitely has her toddler moments, and certainly has her share of obsessive behavior, but who among us doesn't? Of late, Dear Alex has been all about mommy, and can't seem to bear a moment without her, or without a careful explanation of where mommy is, and when she'll be back, and she seems to regard daddy as merely around to give her what she wants when she wants it - kind of like Beautiful Wife, now that I think about it. I mean that, of course, in the nicest possible way, in that there's very little I wouldn't do for either of them - it's an extraordinarily happy and easy time and Alex has an astonishing ability to hypnotize and / or charm you into forgetting the whining and crying and (so I've heard) two-year-old behavior by breaking into song, reciting words from favorite books, or breaking out into the most amazing and unintelligible stories of something she's done or wants to do. It's a great time figuring out what the heck she's talking about. I'm impressed mostly by how many words she has, and the odd things (songs, stories and games - including the entire back cover from "goodnight moon", and all the words to "The wheels on the bus...") from the dim dark past of months ago that she remembers. Another great delight of late has been her ability to express what she wants and what she's feeling - this is not something that she's completely mastered by any stretch, but it's been great to be able to hear and act on "Alex hungry, Alex tired, Alex go for a walk outside" - at least you know what she needs, and can help. That's what I'm here for. From Dear Aunt Linda: The magna doodle. I'm thinking of getting a few more of them for Beautiful Wife and I to play with, as well as one to keep in the car, one for the house and one for the city, and maybe one as a spare. Dear Alex loves it, and has a great time endlessly making dashed off expressionist gesture drawings, then making them disappear. No batteries, no mess, just quick gratification. Dear Alex likes to sit with daddy and make me draw things for her to erase. She gets wierdly specific about what to draw and where - then takes great joy in erasing it, and making me do it again. Forget the producer thing - she's got the makings of an advertising Creative Director.